Congrats to Christina for being named the number 1 travel advisor at her host, OutsideAgents! She outsold 5,000 others for this prestigious spot, and credits much of her growth to her attendance at GTM. We couldn’t be more proud! Kareem was featured in NACTA's magazine for his unique and incredible business. Click here to read the article about this talented first-time GTMer! Go Kareem! Way to go, Kirsten! Her agency is just in its third year, and they were recognized by Disney Destinations as a top sales performer. Kirsten was also selected as an ambassador for GTM in 2018. We hope you'll bring the trophy with you! We would like to extend a big congratulations to Tara McCoy for taking home the Sandals Chairman's Sales Achievement Award. She was chosen from over 150 travel advisors! That's what we call #GTMElite. Congratulations to Donna Alkarmi for achieving 500 Club Gold Level with The Mark Travel Corporation. This means her agency reached over $1.2 million in sales with Mark Travel alone. What an awesome accomplishment! Palace Resorts hosted its fourth annual Palace Global Conference and awards at the brand’s signature resort in Ocho Rios October 1-4, 2017. Moon Palace Jamaica welcomed travel agents, tour operators and industry insiders from the United States, Canada, Mexico and Latin America. There was exclusive events, and workshops during the four day conference. The final night consisted of a black tie gala where Palace Resorts awards the top agents around the world with the highest sales in various categories. Our very own GTM advisory board member Melissa Varela from Modern Romance Travel won a Gold Crown award. Congratulations to all of the winners! Mathy was recently featured in Conde Nast Traveler as an expert cruise seller! The magazine interviewed her to teach budding travel advisors how to sell their first cruise. Congrats, Mathy! You can read the whole article here. Donna, Cindy, and a group of dedicated, successful travel advisors with over 125 combined years of experience who do more than 1 million in sales per person per year, do private trainings with major industry suppliers to learn about what is new with their companies. This year they met with The Mark Travel Corporation, Avanti Destinations, and Karisma Resorts. The suppliers seek these advisors out, and Donna says they have these type of specialized meetings 6 times per year in addition to more mass market events. Shari’s bookings started on her first day back in the office from GTM 2016 with Fiesta Americana Live Aqua. Then came a short-notice Italy package booked through Europe Express, which left her wondering, “Where have they been all my life?” She’s also rekindled a relationship with Travel Impressions after not having booked with them for a number of years. It was at GTM that she learned a lot has changed at TI. Because of the wonders of the GTM Connection Concierge, Shari was able to meet with JoAnne Bundock of Edible Destinations and the two cooked up a trip to the Italian Alba White Truffle Festival. Oh, and you’ll want to check out her Facebook page, because she’s now signed up for Passport Online’s ESP’s social posting service and it netted her two bookings in one day! In November 2016, members of the GTM Advisory Board led peer-to-peer sessions at Travel Weekly’s CruiseWorld. Donna Alkarmi, Lisa Fletcher, Ginny Mariano, and Geoff Millar shared their expertise on topics such as cultivating supplier relationships; selling romance, all-inclusive, and luxury; generating referrals, bringing on ICs and defining a niche. Since attending GTM in August 2016, Donna’s agency has sure been busy. Her sales with The Mark Travel Corporation have escalated and her agency is now GIVC certified. She began selling Beds Online, made Europe Express a preferred supplier, established a relationship with Barceló and added Shore Trips to the company website. Group sales rose, including a band group of 35 rooms and counting. Possibly the most exciting of all is the new division of Stepping Out Travel which launched in February 2017, thanks to the networking and brainstorming that happened with her fellow #GTMElite. Twelve lucky GTMers participated in the very first “GTM-only” FAM trip to Maui in December 2016. Jacquie Hurst had the “challenging” job of escorting these advisors as they experienced all that Maui, Molokai and Lanai have to offer their clients, including hula dancing, ukulele lessons, Maui wine tasting and a truly breathtaking charter flight to Molokai where they discovered the island’s incredible history. The MVCB and HVCB organizers all agreed this was the most professional group they have ever hosted. We could have told them that! Congratulations to GTM Advisory Board member Donna Parent Alkarmi and her agency Lone Star Travel for taking home the Playa Awards for Top Wedding Agency USA and Top Seller Overall USA! We're so proud of you, Donna! 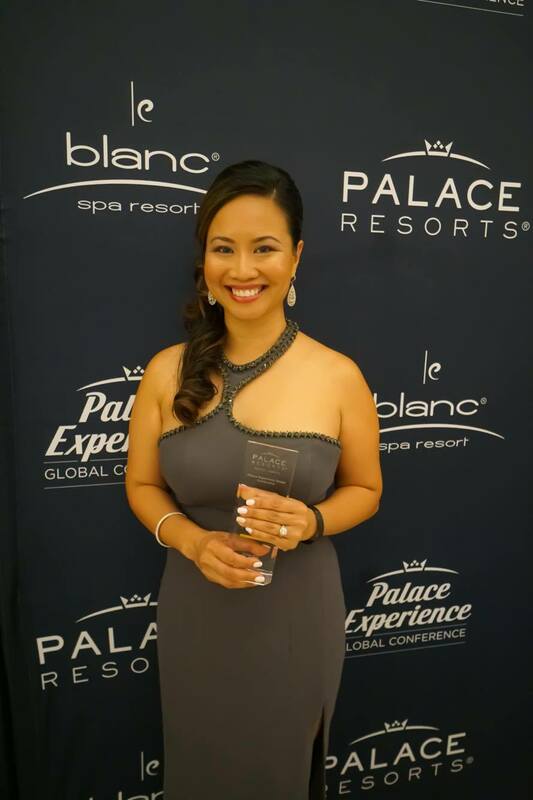 Melissa was awarded a 2016 Trendsetter Award at TravelAge West's WAVE Awards. Congrats, Melissa! The GTM Team would like to extend our sincere congratulations to past attendee Sally Black, who was named a G Adventures Ambassador of Change. Way to go, Sally! Connie's agency was recognized by Princess Cruises for Sales Excellence. Great job, Connie!